The Sherlock Holmes Reviews: Becco Beccare Bastianich Bravisima! The provenance of the name 'Hell's Kitchen', that now gentrified area west of 8th St. in Midtown Manhattan north of 34th St. and south of 57th St., has been bandied about almost as often as our dear Mrs. Hudson frets about her proper Scottswoman's breakfast! Perhaps one of the most plausible explanations appears to be the dense propensity of butcher's, slaughterhouses, and disparate rookeries that had sprouted up in this tight little area in the mid-1800's. When melded together with the steamy and hardscrabble German-Irish denizens and disparate street vendors cooking and openly exchanging their (ahem) 'services' curbside, along with the visceral (and openly visible) nefarious street gang activity (you might visualize Scorcese's 'Gangs of New York'), this West Side sector rightfully garnered the infamy of being 'Hotter than Hell'! 'Hotter than Hell' indeed for it was this very proclamation, infamously voiced by one rookie green patrolman upon witnessing before him a conversation between two of the area's hooligans (using knives), which caused his more veteran partner to then opine 'It may be hotter than hell, but THIS here? THIS is Hell's Kitchen!" And thus 'Hell's Kitchen' was baked solidly into New York lore, with 'Kitchen' being the definitive word here. "Where else, except maybe Paris, are there so many great restaurants to choose from …. than here on Restaurant Row!" There and then Restaurant Row in Hell's Kitchen was born, the name bestowed upon the thoroughfare bursting with the esteemed eateries found on this stretch of W. 46th St. in Hell's Kitchen. Now, in the winter of 2013, it beckoned us for a preliminary investigation of our own. Circumstances and timing being what they were it was decided that rather than rush hastily to arrive and dine prior to this Cyndi Lauper/Harvey Fierstein extravaganza, we would visit these environs afterward, calling ahead and making what would surely be an unnecessary reservation for 10:30 PM….. 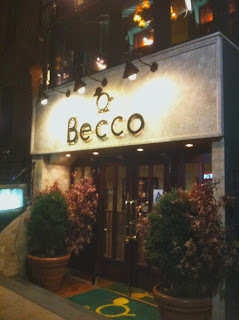 It was only dining with Watson during a prior excursion at 'Esca' on W. 43rd St. of this year that we were brought into the nexus of 'Becco' in the first place. On that visit my investigative instincts unearthed that the matriarch of 1/3 of Esca's Pasternak-Batali-Bastiniach triumvirate had opened previously opened 'Becco' in 1993 and has been keeping patrons deliciously sated ever since. Thereupon, leaving 'Esca', a mental note was made to return to the area and perform a further review of this progenitor establishment. Yet truth be told, the arrival and subsequent company of Lady Cassandra immediately diverted my investigative attention much more than I had anticipated for her form and beauty was beyond what I had remembered or imagined it would be. Deciding to add a Maker's Mark Manhattan or two to allow me to get my bearings again and remove the harsh traveling edges of this sleuth seemed to only leave me more smitten and beholden! This case would certainly be much more difficult! Seated at a fairly tight and crowded table, it must be mentioned that the din of this restaurant with it's reverberating ceiling pummeling sound waves all about us essentially eliminated the ability to hear much more than a jumble of words between us, and certainly none of those from our mumbling and angst-ridden waitperson. For from his first verse methought his morose verbal tendencies were simply rehearsal lines for a nearby depressive-ridden audition. In episodes like this one where my faculties are being compromised by senses all about me (both alcohol and female related) I amble along a well worn mental path by choosing an establishments' flagship item and let the laurels rest where they may rather than venture into unchartered territory needlessly. If a restaurant's reputation is to be tested let their success be on that which they profess to excel at or hoist them up by their own petards with it's failing! It was not difficult to find Becco's specialty for it is positioned at top dead center of their concise yet well balanced menu: "Sinfonia di Paste", the unlimited tableside service of three freshly made choice pasta's by Executive Chef William Gallagher. Pushing both Lady Cassandra and myself in our decision making was the ever-present and busily wandering servers hoisting hot skillet's of these freshly cooked pasta's dishing out seconds (and thirds) to other hungry patrons. With the primer of Antipasto Misto also included in the $22.95 price it was quickly decided that we would let these morels find their own level. Arriving quickly, the Antipasto Misto (a sampling of marinated and grilled vegetables along with a side of pickled and marinated seafood choices) and surprised us both with it's substance and it's lightness. This item alone would be a splendid pre-show theater treat of sparkle, taste, and perfect balance…..giving an attuned theatergoer the needed satiation without the accompanying post-meal sleepiness! After enjoying the Misto, fresh plates were delivered and the three pasta's arrived in order: A delicious Portabello Mushroom Ravioli (methinks this was what was served for I did not actually hear our James Dean SAY this! ), a luscious Rigatoni Pomodoro, and then a Linguine with a delightfully fresh clam sauce. Each pasta was remarkable in it's own right, delivered perfectly al dente with each of these initial portions and thusly savored for it's taste and aroma. However, and I must speak openly, when taken in triplicate these three flavors soon overwhelm one's palate and this did not render one's viscera calmly. The clam sauce, with it's brothy and briny bromide (delicious as it is and served with fresh clams -in the shell no less) did not necessarily meld when taken in any volume with the Pasta Pomodoro and a Portobello Ravioli in a cream sauce. While a little is wonderful, 'a little more' came off as less so. Picking your favorite of the three and then moving for a second (smaller) helping might be the preferred way to go and yoll surely come up trumps! And not until after 1 AM did we arise from the small comedy club sized table and venture out into the New York air, but not before we were effusively 'Thanked' for coming in on our way out….. a surprisingly sincere vocal gesture appreciated as it was received. It was then that I noticed additional patrons still waiting to be seated for their own Bastiniach experience! The authenticity of the meal and the relatively light effect on one's purse in comparison to many other locations citywide was not lost on more people than I had imagined. So with constitution fortified, mental capacities returning, and still in the presence of the Lady's loveliness, a healthy 15 block walk to the hotel was MORE than what the good Doctor might have ordered and we made our way slowly from our bubble back into the realities of the real world. My kingdom for the bubble's return! Advice to be heeded, make the post show reservation and enjoy the experience.